Our top priority at WCS Automotive is to help ensure that you’re never stranded on the side of the road. We are conveniently located in Rockland, MA and are prepared to perform your timing belt replacement on schedule. That’s exactly where a broken timing belt will leave you. Owners should know the importance of the timing belt to their vehicle’s operation. This belt is one of those engine components that do not have a hard and fast rule about replacement times. If the timing belt’s teeth ever wear down and lose their ability to grip, or worse they break, the engine will shut down completely. That’s why our qualified technicians perform thorough routine checks of your timing belt’s condition. It’s necessary for you and our technicians to stay ahead of any timing belt issues. This rubber belt is lighter and more efficient than other metal timing chains, but they do need to be replaced at the manufacturer’s recommended intervals. Our technicians will let you know if your timing belt is the cause of any problems, and if it should be replaced soon, if not immediately. The timing belt has teeth that wrap around the camshaft and crankshaft, which allows for the split second precision of the opening and closing valves. This complex interaction between the valves, pistons, and crankshaft is synchronized by timing belt. If this belt breaks or slips due to wear, internal engine damage may occur. Timely belt inspection and service will prevent costly engine damage and replacement costs. You should review your owner’s manual for timing belt replacement intervals. Most are required at approximately 60,000 to 100,000 miles. 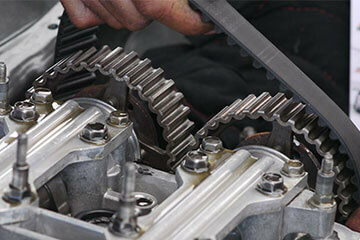 However, the specific time to replace the timing belt will depend on a few factors. For instance, vehicles that are working harder by towing, pulling, or carrying loads will require a timing belt replacement sooner. The specific recommendations for your vehicle’s replacement intervals have been determined by the manufacturers, and they can be found in the user’s manual. Schedule Your Timing Belt Replacement! These recommendations are formulated by the experts, but intimate knowledge of your driving habits and the vehicle’s purposes will always paint a clearer picture. Our team is highly qualified to handle any timing belt repair services, including repair or replacement of internal components, like camshafts, levelers, water pumps, drums and more. It’s easy to forget about the timing belt. Don’t wait until it’s too late. After the timing belt snaps, you’re stranded, and there may be damage to engine parts. Give us a call today at 781-871-1337 to schedule your timing belt inspection or replacement service. You can save some time right now by using our convenient online scheduling system. Next time you’re in the area, stop in to meet our experts. We gladly accept all walk-ins!